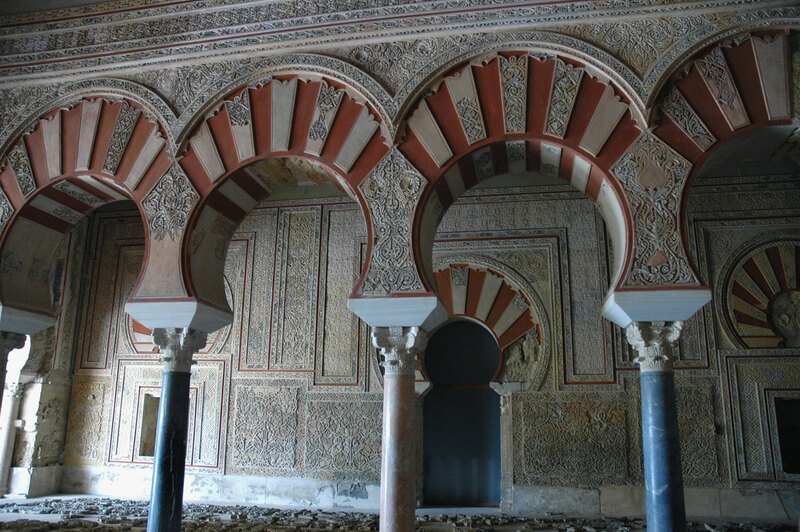 Medina Azahara: Included in the World Heritage List by UNESCO since 2018. The history of Medina Azahara, the magnificent, enigmatic city palace which was built for Abd-al Rahman III at the foot of the Sierra Morena mountains five miles from the city, is shrouded in myths and legends. According to popular belief, Abd al-Rahman III, after proclaiming himself Caliph in 929 A.D., after eight years in power, decide to build the city-palace in honour of his favourite, Azahara. However, recent research strongly suggests that the real reason for the Caliph founding Medina Azahara was to promote the new image of the recently-created independent western Caliphate as a one of the strongest, most powerful kingdoms in Medieval Europe. The city was built on three terraces, surrounded by a city wall, with the Royal Castle situated on the highest and the middle levels. The lower level was reserved for living quarters and the Mosque, which was built outside the walls. Historical sources mention ten thousand people working daily on building the palace complex, on which no expense was spared by Abd al-Rahman in order to achieve the desired propaganda effect: he would project the image of the new city like the flagship of the powerful kingdom he governed. Rich marbles of violet and red, gold and precious stones, as well as the skilled work of artisans from the best quarries and the now legendary Byzantine contributions, helped to make the palace take on its full glory. The part of the Castle which was public was where the official visits took place. In the highest part, stood the High Hall, with five naves decorated with arches. Further down was the Rich Hall: this room was divided into three naves with red and bluish marble arches, with the sides of the building closed, but open in the centre. The Ataurique decoration (carved plant motifs) and the expensive materials used gave the name to this hall, which also had baths and opened out onto the beautiful High Garden. This garden was divided into four parts, with a summer house in the middle and four ponds. Legend has it that the pond in front of the Rich Hall contained mercury and lit up the area with thousands of flashing colours. A series of steep, narrow streets leads us to the great eastern gate, where important foreign emissaries were received by the Caliph. In front of this gate is a large square where the troops were drilled and the ceremonial staff prepared for the new arrivals. Outside the city walls stands the Mosque, which is said to have been built in just over one month. The site was completely destroyed by the succession of Civil Wars which ravaged al-Andalus at the turn of the 11th century, and Madinat al-Zahra is now in ruins. The immense effort taken to create this fantasy city was smashed to pieces after only seventy years, too short a life for what was the first Caliph’s «favourite».